Thermally bonded nonwovens (thermobonded nonwovens) is where the fibres are bonded thermally. This means that the thermoplastic fibres are bonded together or with other fibres with the help of thermoplasts or thermoelastic materials. For this purpose, suitable bonding fibres can be mixed in with the fibres during manufacture. The thermal activation is achieved with hot air or by using calenders, the nonwoven material can even be partially bonded using ultra-sound. 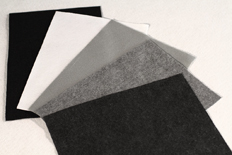 Using thermal bonding, the bonding rigidity is considerably increased and so lighter nonwovens can be designed. The rigidity of thermally bonded nonwovens depends on the type of polymer used and the parameters of the fibre manufacture as well as the thermal bonding conditions.